To some, LinkedIn still has a reputation as a place to post your resumé and connect with colleagues. A long time ago, it was just that, but now it’s so much more. LinkedIn is a powerful social network for everyone from solopreneurs to huge businesses, boring or not. But are you doing it right? How can you be better? 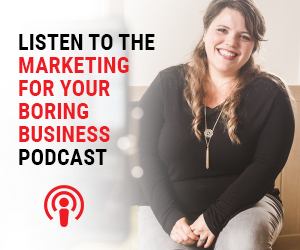 This week I talk with Jo Saunders, Australia’s LinkedIn Demystifier, about sprucing up your profile, making meaningful connections and showing the best side of your boring business online. Jo Saunders is an international LinkedIn expert, marketing strategist and social media educator who has been helping people connect and communicate since the early 90s, through pen and paper, events and social media. In the era of social business, to be found, remembered and chosen it is important to build visibility, establish authority and earn influence in a connected economy. Affectionately known as Australia’s LinkedIn Demystifier, Jo demystifies the complexities of LinkedIn and social marketing tools, through her presentations, workshops and mentoring. 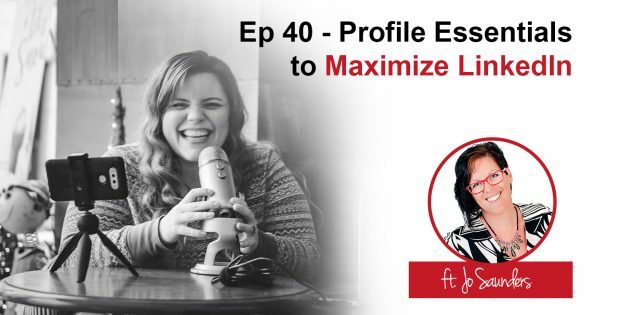 She has spoken on local, international and virtual stages, and has trained thousands of people around the world in using LinkedIn more effectively. She was named one of the top 200 LinkedIn practitioners in the world, ranked number 4 on Klout’s LinkedIn expert list, and is the co-author of ‘Get Good or Get Off – A guide to getting it right on social media.’ She is a co-host of #LinkedInLocal Perth and #TheLinkedInCouch a new video series, and recently spoke at the world’ largest social media conference; Social Media Marketing World.